Your local council voted to spend up big on 'feasibility studies' to get an oceanside CST rammed through. About $865,000 big! $243 per page and it glossed over or omitted key critical facts and components. Then came the Price Waterhouse feasibility business study, approximately $800,000 for 286 pages. That's a whopping $2,797 per page!!! Released by council the report redacted/censored the equivalent of 56 pages. 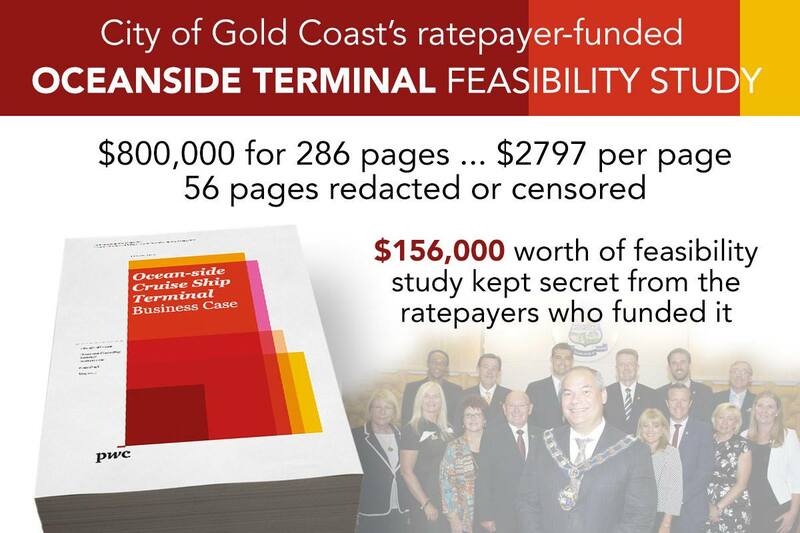 That's approximately $156,000 worth of feasibility study that your council is refusing to make available to the ratepayers (public) who funded it, own it and paid for it. The QUEENSLAND AUDIT OFFICE encourages the public to report financial mismanagment being undertaken by our councils. In fact, they urge and state, "Members of the public are encouraged to raise issues about known or suspected financial waste or mismanagement. Submissions need to relate to public sector entities or money being spent on public services." We urge the public who have concerns to contact and make a complaint. 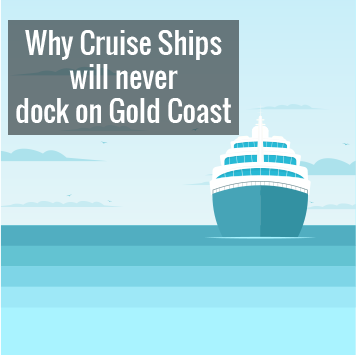 "We won’t give up on cruise terminal"
The Gold Coast group behind a proposed $4.4 billion cruise ship terminal development are berating State Government for rejecting it at the first hurdle. Not to get distracted by the pointlessness of this absurdity, however it should be known that the hysterical rantings from proponent Craig Perry, as reported here, have little in common with the facts. We’re seeing similar verbal and physical threats towards concerned Gold Coast community members and volunteer community groups as we scrutinise and publicise the activities of development lobbyists, politicians, candidates and their business associates who knowingly and willingly flaunt electoral legislation (as revealed by the CCC's 'Operation Belcarra') and ignore the intent of the Local Government Act and State Planning Laws. 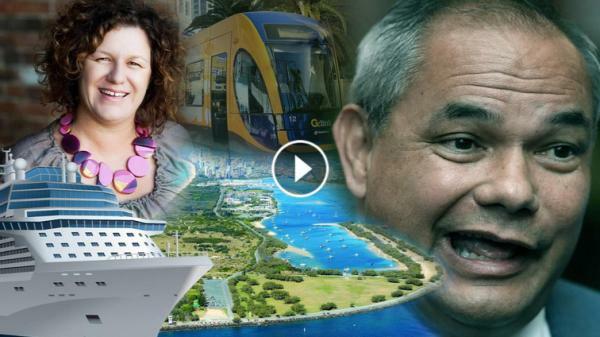 Save Our Spit shares some of the concerns recently aired by MP Rob Pyne - that Queensland needs a truly independent ICAC-style overhaul and investigation into immoral, unethical illegal and corrupt practices in all tiers of government. "Ultimately it was not my choice to finish with the newspaper, but in reality the proud journalist inside me couldn't continue. I received the email about my column ending late on a Thursday afternoon. How did it get to this?" ABC Radio with Steve Austin from Brisbane - a must listen.